Join over 38 million neighbors across 16+ thousand communities around the nation for National Night Out, an annual community – building campaign that promotes police-community partnerships and neighborhood camaraderie to make our neighborhoods safer, more caring places to live. Together, we are making that happen. 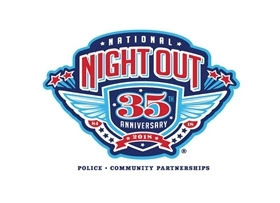 National Night Out is a crime and drug prevention event that is sponsored nationally by the National Association of Town Watch and co-sponsored locally by the Bishop Police Department. Along with the traditional outside lights and front porch vigils, most communities celebrate National Night out by hosting block parties, festival’s, parades, cookouts and other various community events with safety demonstrations, seminars, youth events, visits from emergency personnel, exhibits and more. Join us on Warren Street on Tuesday, August 7th, 2018 from 6PM – 8PM. The public is invited to come out and get to know your neighbors at a community block party. We will have Law Enforcement & Fire Department displays, Breast Cancer Awareness Patch Fundraiser by the Key Partners – Wives Behind the Patch group, a 911 For Kids Phone Booth, and much more!